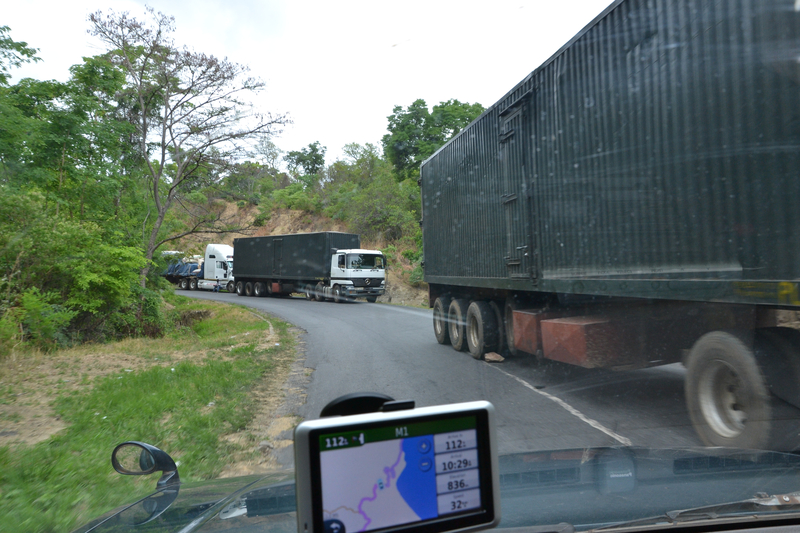 At the end of the last installment, we had stopped for the night in Karonga, Malawi, a good-sized town near Lake Malawi. There wasn’t much to see in this town so we were up and out fairly early the next morning for a full day of driving. And what a day it was. 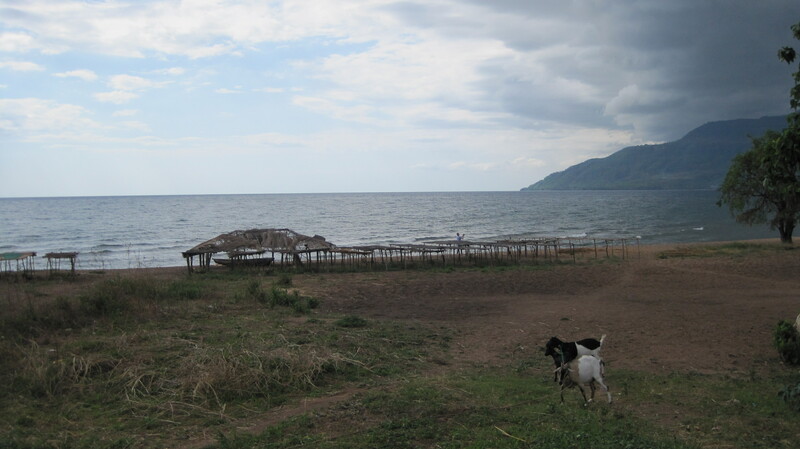 The route took us first along the shores of Lake Malawi. If you have ever seen one of the Great Lakes of the United States and Canada, you’ll have an idea of Lake Malawi’s size. It’s about 350 miles long and about 45 miles across at its widest point. It’s the ninth largest lake in the world. The initial part of the drive along the lake was very pleasant, since the road followed close to the shore. This scene is typical. Except for the goats it reminds me of Lake Superior. As we drove we discussed the possibility of taking a side trip to Nyika National Park. On the map it looked so close and convenient! Just a quick jaunt off the main road and back. Fortunately K’s caution prevailed and we didn’t attempt a 75-mile one-way trip over barely extant roads to a remote national park. We later read about another visitor’s trip to this park and learned that the travel alone is an all-day effort. Since I had a plane to catch out of Maputo 9 days hence we thought we should get some more miles under our tires before adding any detours to the trip. Nevertheless the day provided plenty of adventure. After about 75 miles along the shore, the road bent away from the lake and started climbing up a rugged rocky plateau (I believe it was the Nyika Plateau, although my maps are unclear on this point). Up and up and up we went, on a winding, mostly dirt and stone track that hugged the side of the hill and left very little room for error. These moments are sobering – when you realize that there is only one route between where you just came from and where you’re going, and that route appears to be blocked. But, maybe not – we were waved through. A rutted track had been dug out in the dirt right up against the flank of the hill. Mitsubishi don’t fail us now! I dunno, should I have added a modesty blur? 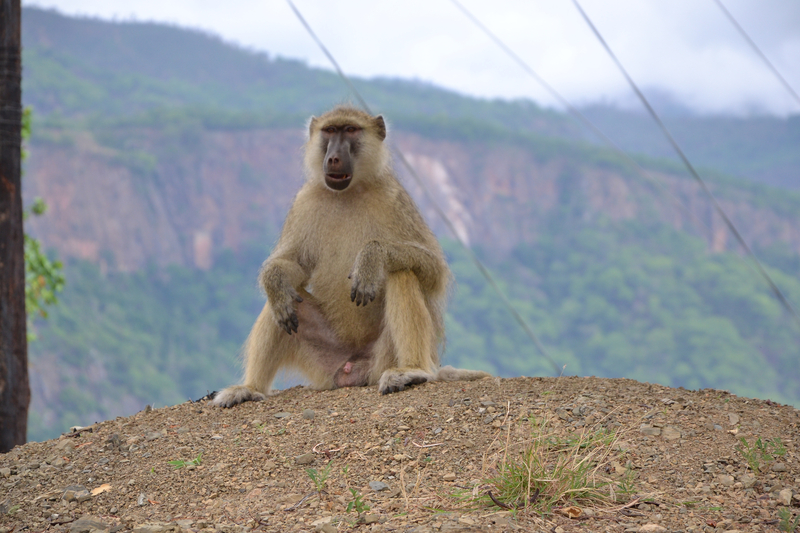 Unlike his brethren to the north in Tanzania, this guy wasn’t at all camera shy – or modest, for that matter. In next week’s installment the Keystone Kops (aka K and Jennifer) change a flat tire and experience some true Malawian hospitality.